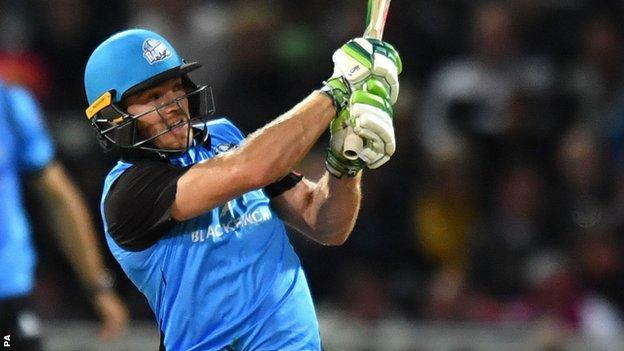 Worcestershire won the T20 Blast for the first time as they beat Sussex at Edgbaston by five wickets. On their first appearance at Finals Day, Moeen Ali’s side chased a target of 158 with nine balls to spare. Just as in their semi-final win over Lancashire earlier in the day, Worcestershire owed most to captain Moeen and wicketkeeper Ben Cox. Moeen took 3-30 in Sussex’s 157-6 before hitting 41, while Cox saw them home on 158-5 with 46 not out. Although sadly watched by a mere 500 Pears supporters after problems with ticket allocations to the four semi-finalists, it was still a memorable day out in Birmingham. Cox’s match-winning innings followed to his earlier 55 not out off 34 balls against Lancashire, and his winning hit for four over square leg off Jofra Archer triggered wild scenes among their small band of followers as Worcestershire celebrated their first trophy since 1994. It looked like the ball might be running Worcestershire’s way when Sussex received an early jolt as opener Phil Salt was clumsily run out just as he was getting into his stride. Salt was dismissed with his feet off the ground within the crease as a Brett D’Oliveira direct hit struck the stumps at the non-striker’s end. The south coast side were then at their best in a 58-run second-wicket stand between another Warwickshire old boy Laurie Evans and semi-final hero Luke Wright. Even when Moeen bowled Wright, third-wicket pair Delray Rawlins and Evans kept the score moving with 44 more in 26 balls. But from 121-2, when Moeen had Rawlins caught by Brown, then also bowled David Wiese, Sussex lost their way to fall short of par on 157-6 – 46 fewer than they had managed earlier in the semi. Worcestershire openers Joe Clarke and Moeen started well, galloping past 50 inside the first six Powerplay overs. But within four balls, Clarke was caught behind off Danny Briggs, before Will Beer tempted Tom Fell to drive to short extra cover. Three overs later, Brett D’Oliveira, run out without facing in the semi, was on the wrong end of a very tight television umpire stumping call. Moeen was caught at deep long-off, again for 41 after making the same score in the win against Lancashire, then after putting on 36 with Cox, Ross Whiteley was caught in the deep, also on a video replay, trying to bail out a waist-high Jofra Archer full toss. But Cox, dropped for this week’s County Championship game with Surrey following a poor run of form, had showed in the semi-final he was a man who performs under pressure. Still needing 33 off 19 balls when he was joined by Ed Barnard, he made mincemeat of the challenge, as it was Sussex’s fast bowlers who fell apart under pressure, to win his second man of the match award of the day. 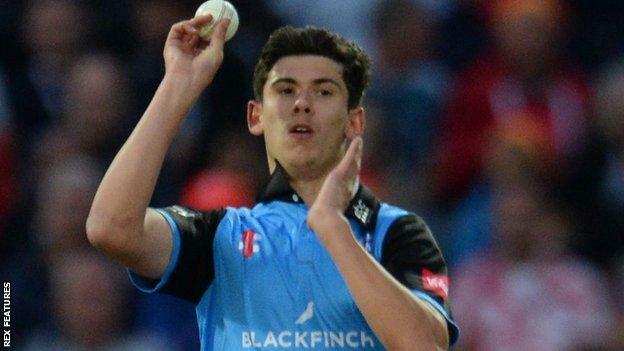 Worcestershire had been 97-6 in their semi-final with Lancashire earlier in the day after surviving the loss of three wickets in successive balls. It took an unbroken 72-run stand between man of the match Cox and Barnard (28) to see them to a defendable total, after which Moeen, following his first 41 of the day, then took 2-16 in a fabulously economical four overs, including the key wicket of England team-mate Jos Buttler. After taking 4-21 in the semi-final to move to within two scalps of breaking the English record for T20 wickets in a season, Pat Brown ended up wicketless in the final – but his four overs went for just 15, the tidiest figures of the day. “The find of the tournament”, was the judgement of no less an authority than James Anderson, England’s all-time top Test wicket taker, who has already earmarked the 20-year-old Worcester University student as international calibre. “I said today that I wanted us to fight and be brave and that’s exactly what we did. “I’ve been at the club a long time and it’s been tough and a long journey since we last won a trophy. We were the underdogs coming into today, I thought we performed extremely well and we deserved it. “I knew we were going to win today having played with these boys so well, even when we were up against it. “Everyone that lives and works in Worcester, it’s amazing for them. We get so much support from them all year round, even in the hard times. “It’s hard to take it all in. “It’s a great day for us, but it’s for the fans too. It’s been nearly 15 years since the club’s last trophy, so it’s class. “You’ve got to give credit to Worcestershire, they bowled brilliantly. “Another 15 or 20 runs might have made a difference and we were disappointed to lose Salty the way we did. “But Worcestershire deserve it. They’ve played that way throughout the competition. “We’re looking over at a team who’ve been performing extremely well all year. “You can see they’ve turned up today and were the better team. We can walk away knowing we’ve had a brilliant competition and hats off to Worcestershire, they deserve it. “We felt we were under par at halfway. When that happens, you need an early wicket and they started very calm.